Was Sundiata a real person? Nobody knows exactly how long the storytellers of West Africa have been telling stories about Sundiata, the prince of Mali. 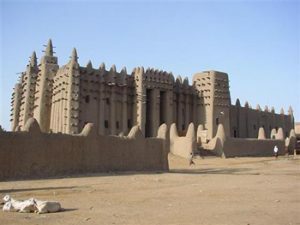 We can be pretty sure that Sundiata was a real person, and really a ruler of Mali, because Ibn Khaldun mentions Sundiata, only about 150 years after his reign. But nobody knows how old these stories are. The oldest written record of the story of Sundiata goes back about 100 years, to about 1895 AD, but the story is probably much older than that. The Epic of Sundiata begins before Sundiata was born, when King Maghan of Mali heard a prophecy that he must marry an ugly woman, and their son would be Mali’s greatest king ever. Sure enough, two hunters came by after a while with a very ugly woman. Her name was Sogolon. So King Maghan married Sogolon, and soon they had a son, and that was Sundiata. Now King Maghan already had a son, with a different wife, and his first wife, Sassouma, was very jealous when she saw that King Maghan intended Sundiata to be the next king, instead of his older brother, Dankaran Touman. How happy Sassouma was when the little boy, Sundiata, turned out to be no good at all! He was ugly like his mother, and slow – even when he was three years old, he still couldn’t walk and he could hardly talk at all. King Maghan was worried too, but even so he respected the prophecy, and so when he was dying he gave his best griot – his advisor – to Sundiata to help him become king. When King Maghan died, Sassouma made sure her own son, Sundiata’s older brother Dankaran became king. And Sundiata still couldn’t walk, so he couldn’t do anything about it. But one day Sassouma was making fun of Sundiata’s mother, Sogolon, and she started to cry and then got angry. Sundiata said, “Don’t worry, Mom – I’m going to walk today.” Sundiata asked for an iron stick, and he used the iron stick, slowly, little by little, sweating and shaking, to pull himself up, and then he could stand! He pushed so hard on the iron stick that it bent into a bow. Now that Sundiata could stand, he was in great danger from Sassouma. To make things worse, the evil king of Sosso, Soumaoro, stole Sundiata’s griot! So Sogolon took Sundiata away to hide while he grew up and got stronger. They traveled around together from kingdom to kingdom, learning to fight and learning wisdom. Then Sundiata heard that the evil king Soumaoro had invaded Mali and thrown out King Dankaran! Right away Sundiata began to get an army together to attack Soumaoro. Sundiata went from kingdom to kingdom all over West Africa, getting more and more archers and horsemen and fighters. When Sundiata was ready, he attacked Soumaoro. At first Soumaoro’s magic was too much for Sundiata, and he was sure he would lose the battle. He was very discouraged. But just then his griot came back, and his griot’s half-sister too! They had escaped from Soumaoro, and they had learned all his magic. They told Sundiata how to beat Soumaoro. So Sundiata beat Soumaoro in a great battle, and he became king of Mali. Then he told all his allies, from all the other kingdoms, that they should all join together in a big empire, and so they did. Sundiata ruled this empire until he died, and his sons and his grandsons ruled after him. Cite this page: Carr, K.E. Epic of Sundiata – African literature. Quatr.us Study Guides, May 19, 2017. Web. April 19, 2019.